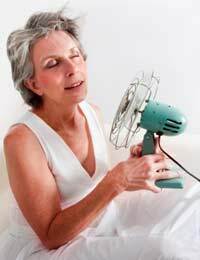 Hot flushes are one of the most common symptoms of menopause. Many treatments are available – both drug and alternative – with the aim of relieving women of this uncomfortable symptom. Along with other menopause symptoms, hot flushes are never viewed as positive and instead, they are typically dreaded by women. But could the seemingly annoying hot flushes actually be serving a beneficial purpose to women’s health? A new study suggests this may indeed be the case, specifically where breast cancer risk is concerned. It is now suggested that hot flushes could reduce a woman’s risk of breast cancer. This natural reaction to menopause may have benefits we never originally imagined. The study conclusion is that women who have hot flushes and other menopause symptoms could have as much as a fifty percent reduced risk of developing breast cancer. More Hot Flushes Mean a Lower Breast Cancer Risk? A lower breast cancer risk from hot flushes may be a reality when compared to women who have no hot flushes and other menopause symptoms. In fact, the higher the frequency and intensity of the hot flushes, the lower the subsequent breast cancer risk. The finding is perhaps a surprising one but it could mean we look at hot flushes and other menopause symptoms in an entirely different light. The study is the first one to look at menopause symptoms and the risk of breast cancer. Typically, it is menopause treatments such as hormone replacement therapy (HRT) that have been examined with breast cancer risk. Such treatments have been linked to a higher risk of breast cancer and other health conditions such as heart disease. Researchers found that the women who had really severe hot flushes, such as the type that would awaken them at night – called night sweats – had a significantly lower risk of developing breast cancer. The risk was between forty and sixty percent lower in the women who had hot flushes and other menopausal symptoms, versus women who had none of these symptoms. Researchers also took into account other factors that could have swayed the results, such as obesity or women taking HRT. Even after doing so, they still found that hot flushes lowered breast cancer risk. With nearly fifteen hundred postmenopausal women enrolled in the study, it is considered a reliable number of participants from which to draw conclusions on the results. Even though menopause symptoms can have such a severe, negative effect on a woman’s quality of life, this study puts things into a different perspective. It could help improve our overall attitude toward menopause given that symptoms may play a previously unheard of beneficial role. The results can also helps us learn more about breast cancer and how we can better prevent it from occurring in postmenopausal women. Further studies will investigate the symptoms further and look to exactly why these symptoms seem to be exerting such a positive effect in terms of breast cancer risk in women after menopause.